Robert Guimaraes Vasquez, a leader of the Shipibo-Konibo indigenous people in Peru’s Amazon has traveled to a global forum in London on business, deforestation and human rights to highlight the destruction of his people’s traditional lands by an international agribusiness group and member of the RSPO (Round Table for Sustainable Palm oil), a global body that certifies that the production and trade of palm oil is sustainable and respects human rights. 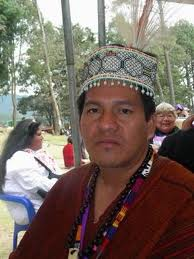 The case concerns the Shipibo community of Santa Clara de Uchunya whose lands were acquired by a Peruvian company, Plantaciones de Pucallpa SAC (one of only two RSPO members in Peru) in 2012 in an undisclosed deal with the regional government of Ucayali. The community only realized when the first bulldozers began destroying the forest. Determined community resistance, including confiscation of company machinery and occupation of the lands combined with continuous lobbying of local authorities and central government finally resulted in a high level investigation in August 2015 by the Ministry of Agriculture.